SCVHistory.com LW3235 | Melody Ranch | Mexican Lobby Card: 'Wichita' (Allied Artists 1955). 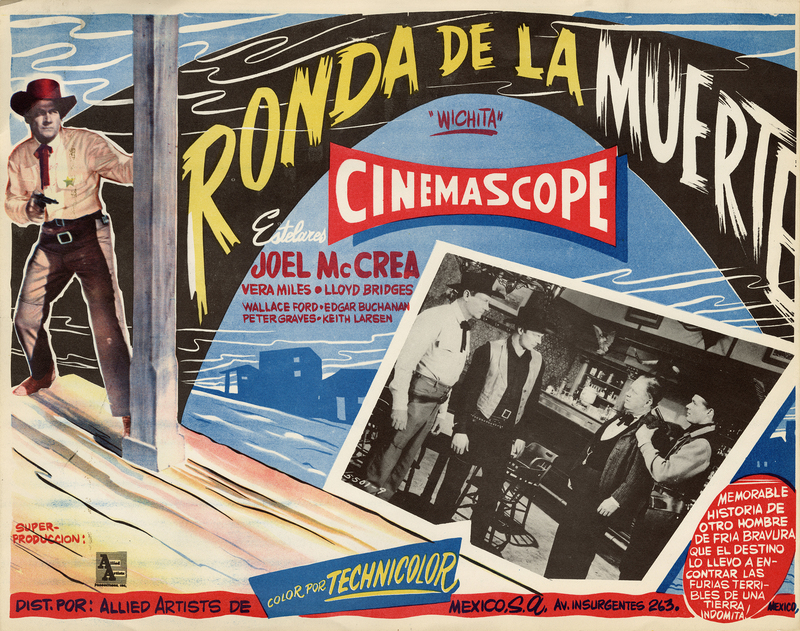 Mexican lobby card, 12.5x16.5 inches (standard size for Mexico) advertising "Wichita" (as "Ronda de la Muerte," or "Round of Death"). Distributed by Allied Artists de Mexico, S.A.
"Wichita" (Allied Artists 1955) is directed by Jacques Tourneur and produced by Walter Mirisch. Credited players include Vera Miles, Lloyd Bridges, Wallace Ford, Edgar Buchanan, Peter Graves, Keith Larsen, Carl Benton Reid, John Smith, Walter Coy, Robert J. Wilke, Jack Elam, Mae Clarke	and Walter Sande. Some interiors were filmed at Monogram/Allied Artists' Poverty Row studio in East Hollywood. Trivia: Peter Graves is the brother of James Arness, aka Marshal Matt Dillon of the long-running "Gunsmoke" TV series, which shot in part at Melody Ranch. Kermit Maynard, Ken's stuntman brother, has a bit part in this film, as does a young Sam Peckinpah, who went on to become a hard-boiled producer. In fact, Peckinpah would direct McCrea and another old Melody Ranch "regular," Randolph Scott, in 1962's "Ride the High Country" (which was not shot locally). In 2009, McCrea (1905-1990) was inducted posthumously into the Newhall Walk of Western Stars. LW3235: 9600 dpi jpeg from original lobby card purchased by Leon Worden.